Marxist ELN rebels have released three soldiers kidnapped a month ago, just two days before a Colombian government deadline on deciding whether or not to resume peace talks with the guerrillas, the country's ombudsman said on Wednesday. The ELN is the last recognized rebel group fighting government forces in the South American country, which has been wracked by more than a half century of guerrilla insurrection and drug-trafficking violence. The three soldiers were handed over to a humanitarian commission made up of the country's ombudsman and the Catholic Church and "are now being transferred" to Arauca, close to the Venezuelan border in the northeast. Military trio Yair Vega, Juan Pablo Rojas and Eduardo Caro were unarmed and wearing civilian clothes when they were taken on August 8 in the restless northeastern region. The ELN had stated on Tuesday it would release the three unconditionally. In the first images released of the soldiers, they can be seen walking in a jungle area with an ELN banner visible in the background. 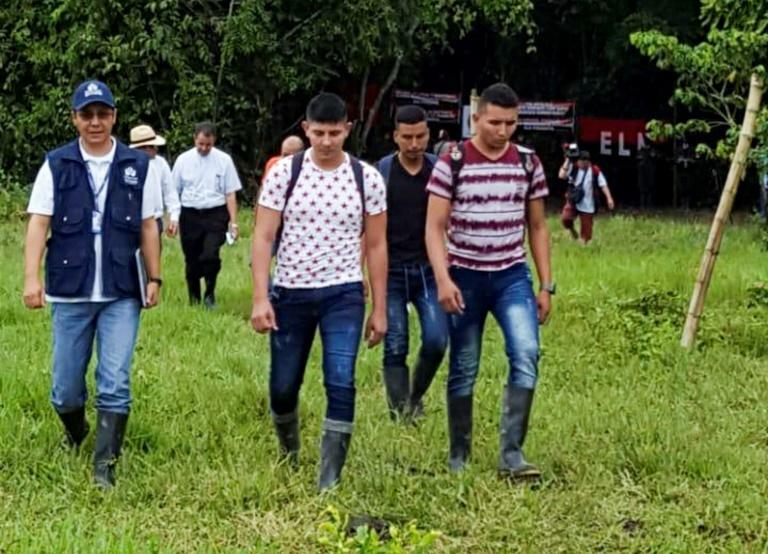 The ELN is holding another six people: three police officers, two civilian contractors and another soldier, who were kidnapped a week before the three released military personnel. Colombia's right-wing President Ivan Duque reiterated last week his demand for the hostages to be released as a condition for restarting peace talks that were put on hold after his predecessor Juan Manuel Santos left office a month ago. Duque said he would only speak to the guerrillas if they "suspend all criminal activities" and agree to "demobilize, disarm and reinsert" into civilian life, but that "the liberation of hostages" was a prerequisite. "We cannot legitimize violence as a mechanism to put pressure on the state," he added. When he took power, Duque said he was giving the ELN a one-month deadline -- which expires on Friday -- to convince him to restart the peace talks. Following the historic December 2016 peace accord Santos signed with FARC guerrillas, the ELN remained the last notable left-wing rebel group refusing to lay down arms.